Angus McEwan, RWS RGI RSW Textures in Watercolour Masterclass – second chance! By popular demand, we are delighted to offer another opportunity to work with one of Scotland’s foremost artists in watercolour. This intense weekend will allow you to explore the true potential of watercolour and its ability to describe different objects, unique surface characteristics and calligraphic quality. You will push your work on and have fun into the bargain. The weekend will start on the Friday night with a lecture and a chance to prepare for the following day. On Saturday, after a discussion and a demonstration by Angus you will produce a series of textures exploiting the potential of watercolour to describe different surfaces. The idea is to experiment and find the limits of the media. Then to drawing and painting objects! Angus will provide a series of old tools, weathered artefacts and dried flowers/fruit etc. but you can bring your own objects if you prefer – with textured surfaces of course. Drawing objects through simplification and using contour line, you will explore simple wash and line techniques to build confidence and get to grips with colour and layering. 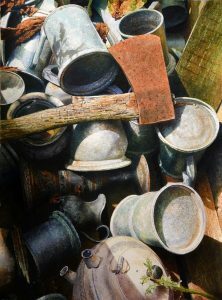 By the end of the weekend you will have a catalogue of personal techniques and textures and a series of paintings which reveal the character, surface and the hidden beauty within ordinary, well-used things. You will have built confidence in your creative and technical abilities and will want to explore this approach to watercolour further.